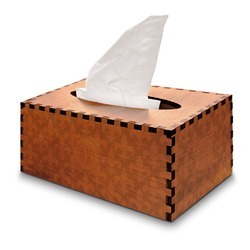 These rectangular tissue boxes are made of beautifully cut wood in your choice of cherry or birch. They are fit together by interlocking finger joints, which results in a modern square patern along the edges of the tissue box cover itself. An oval is cut out of the top in order to easily pull your tissues out. There is no bottom in order to slip your cover on and off your tissue box with ease. Your very own design is laser engraved into each side of the tissue box cover to create a subtle grayscale design. They measure at approximately 9.5"W x 4"H x 5.5"D and should fit over a typical rectangular tissue box. Choose your favorite pattern, ribbon, graphic, text, and more. Create the perfect design in our design center. Have fun creating and give us a call if you need any help.